The CME-11E9-EVBU is a low cost, entry level development package designed to provide similar features of the Motorola EVBU. The board provides MC68HC11E9 Single Chip and Expanded Mode operation with the Buffalo Monitor version 3.4 in the internal Eprom. Application development is quick and easy with the included DB9 serial cable, DOS and Win95/98 Utility Software, Wall-plug Power Supply, manuals and assembler / compiler. Small applications for Single Chip operation can be installed in the internal eeprom (512 Bytes, see CMD711EX for full support) and larger Expanded Bus operation applications can be installed in the external 8K Byte EEprom for dedicated operation. No prom programmer or special voltages required. Additional features provide 68HC711E9 Eprom programming capability, wireless prototype area, EVBU compatible I/O port connector, LCD module port (expanded bus), keypad port (I/O lines) and 32K byte static Ram for program debug or user data. 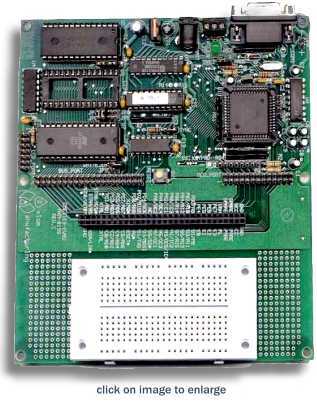 • Supplied with 32K RAM, 8K EEPROM, DB-9 Serial Cable, MC68HC11 Manuals and DOS / Windows Utility Disks with Assembler, EEPROM programming, etc. • Board Size: 5.5" x 6.0"